Log in the Macys Insite employee portal, and choose the My Schedule Plus application, to view daily, weekly and monthly work schedule for Macy’s and Bloomingdale’s. Testing the patience of many of Macy’s employees, Macy’s Inc still has not gotten around to developing a mobile phone ready Macy’s Insite App for employees or a dedicated mobile phone schedule app for the My Schedule Plus program. Macy’s Schedule – My Schedule Plus – Login. 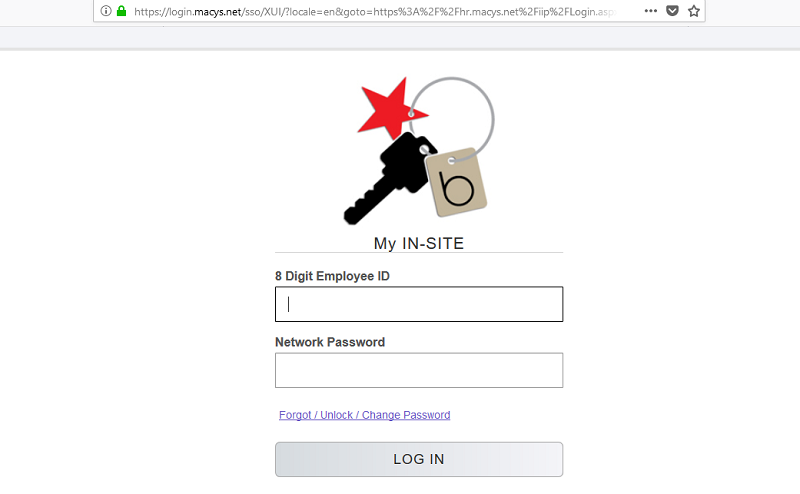 Instead, Macy’s and Bloomingdales associates must still visit the Macy’s Insite login page at: Macys Login, and enter your 8 Digit Employee Id, as well as your Macy’s Insite password. Once logged in, locate the “My Schedule Plus” or “My Day” tab, to start the application and view your Macy’s schedule. Visit www.login.macys.net/sso/XUI/?locale=en#login/ to get to to the log in page. Enter your 8 Digit Macy’s Employee ID to log in. Macy’s Work Shifts and Scheduling System. Macy’s Self-Serve scheduling system lets associates schedule shifts for themselves not only for their home store but also for nearby Macy’s stores. Macy’s work shifts a are generated by a computer system, and not by a person, so store managers do not control the scheduling. Macy’s emplpyees could close one night, and could have to open the next morning. Associates can pick up extra shifts through the Macy’s Insite employee website or they can swap with another employee. If you have an emergency or if you call in sick, it will cost you “credits”, which could lead to termination, if you are absent too often. 1 Macys My Schedule Plus. 2 Macy’s Schedule – My Schedule Plus – Login. 3 Macy’s Work Shifts and Scheduling System.